Follow the conference with your usual Internet Browser!. You will receive the link to connect to the event at the scheduled time. Ogni inizio settimana, al lunedi', Pietro Origlia, trader indipendente che opera sul mercato azionario italiano, incontrera' gli iscritti all'evento gratuito con la sua rubrica SMALL TRADING AZIONI BUY & SELL. - nella prima parte dell'incontro verra' fatta un'analisi sia macro che tecnica su tutto quello che e' successo durante l'ultima l'ottava con uno sguardo in particolare al listino italiano e all'indice tedesco Dax. - commento e spiegzioni relativo alle operazioni di trading svolte durante la settimana. - analisi approfondita sui titoli che potrebbero nel breve inviare un segnale sia short (al ribasso) che long (al rialzo). We apologize for the inconvenience, but due to a very high number of registrations received, registrations to the Live Event have been suspended. If you would like to be informed about the next scheduled Live Events organized by us, please fill in the form below to leave your e-mail address with us. 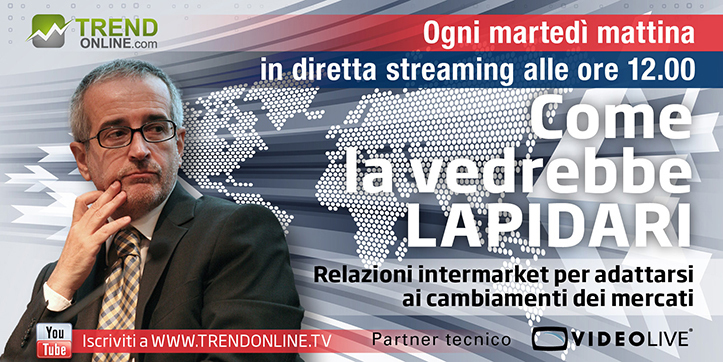 Event organized by Traderlink Srl, with registered office in Via IV Giugno 84, Serravalle, Republic of San Marino. Phone: +390549900757. I do acknowledge that all details that I will submit through this form will be collected and handled by Traderlink Srl. The details will be used, as well as for all purposes pertaining to the organization of the event, also for sending updates, commercial offers, promotions and invitations to events connected to on-line trading (by means of ordinary post or e-mail and also by Third Parties). I am fully aware that my personal details will be collected and handled in strict compliance to the Code of Rules for handling personal data (Italian Law Deecree n.196 of 30 June 2003) and that the details will not be given or disclosed to third parties. I will, therefore, be able to know, amend or have my details deleted, as well as be able to exercise any other right granted by Section 7 of the above-mentioned Privacy Code (Italian Law Decree 196/03) at any moment by sending a recorded delivery letter to the registered office of either of the entities appointed for data handling. Consenting to one's personal data submission to Traderlink Srl is necessary to participate in the event. Having carefully read the Privacy Notice, I hereby give my consent for the handling of my personal details as I have submitted them. Does your broswer support Videolive?